An amateur scientist has captured footage of the mysterious aquatic creature in Loch Ness, that some observers are are calling among the best ever taken. The footage can be observed here, after an annoying advert. On closer observation, you will notice that it appears to be a large, dark, very, very indistinct whatchamacallit. It could be a Plesiosaur. It could be a giant eel. It could be a very long log. It could be a very tall, very svelte Aquaman in a black wetsuit. 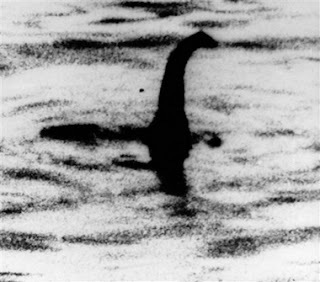 * If this is the best British amateur science research can do, then Nessie will be safe for a thousand years. Gordon Holmes is the 55-year old Yorkshire lab researcher who took the footage and, if I may Gordon, allow me to say that you could really use a good steadicam...and a zoom lens. Also, skip the whiskey course at dinner before venturing out on the Loch. * Or Prince Namor. We don't want to cheese off the people at Marvel or we'll never get invited to the Spiderman 3 premieres. Erm... I could have sworn it was 35 MPH. Brace yourselves. I have a confession to make. I am not always the law-abiding moral paragon of virtue that our regular readers have come to expect. Today, I was caught up in a helter-welter of lawlessness that resulted in a direct and tense face-off (No, not the John Woo type) with the local law enforcement officials. I was returning from a lovely meal of carne asada and queso dip ("Cheeeese Gromit!") when I decided to take my usual shortcut via a two-lane throughfare just off the highway. I was in a pleasant mood and singing when I passed a local school and saw the officer sitting there. I immediately glanced at my speedometre to discover that I was doing 65. OK, that was Kilometres per hour. Fortunately, I was only doing 41 Miles per hour, which was still - amazingly - 16 miles an hour over the speed limit. Obviously, that little village does not intend for motorised vehicles to travel down that particular street. I can barely keep my 2000 Nissan Maxima running at that speed. The thing idles at 30 Mph. Anyway, the officer politely endured my protestations that I could have sworn it was 35 Mph through that street, and did they change the signs recently, whilst filling out the ticket. He suggested I could keep it off my record by attending a local "driving class." Bono's about as likely to turn up in that class as I am. I didn't actually say that out loud, but I thought the equivalent of it intensely. (In a vague, accent, inoffensive to any actual ethnic group) Me no speak the Eng-leesh very good, general! Please no shoot! I love America!! (pause) Is this Can-deed Camera? I'm terribly, terribly, terribly sorry. I only hope that my thoughtless, callous disregard for your speed trap hasn't endangered the life of the heart patient I was rushing to treat. You do realise that the spacetime continuum was warped for a moment at the precise time you chose to point your primitive radar gun at my vehicle, and that the readings you took are not only inaccurate but over 50 million years old? I'm sorry officer, I really had to get home fast and for a good reason. Now that you've stopped me though, is it all right if I just have a leak here on the street? That's a luvvvv-ley gun you've got there officer. I bet you're a wunnnn-derful shot. Was little old me speeding? Ooooh, I hope you don't have to put those nasty old handcuffs on! I'm sorry, but I deny the philosophical dictatorial imposition of the concept of "speed" and "limits." Just because you believe in such moribund concepts as physical reality doesn't mean I should be punished for your refusal to enter the 21st Century with the rest of us! Only 41 stinking Mph? I had my foot to the floor, son! How am I gonna make the field at Talledega drivin' like that?? I'm sorry officer! I was driving as fast as I could to get away from the giant radioactive winged newts! They're everywhere! Everywhere, I tell you!! *F. Johnny Lee informs me that we cannot actually recommend that you use these excuses. Something about fraud and false testimony or whatnot. So don't. Ever. I just had to report that I watched a film Sunday evening with the following title: "Godzilla, Mothra, King Ghiderah." Frankenstein's Gigantic Monster didn't make an appearance but Baragon, his arch foe, did. It was 102 minutes of pure stupid brilliance. My favourite line in the picture occured just after Godzilla blasted Baragon right in the "Monarch of the Glen" with his atomic breath. One of the characters remarked to another, "He hit him right in the gravel pits!" Martin Martin: Good evening and welcome to Football Today. I'm Martin Martin and on the programme tonight we have the daring young English striker who scored a magnificent goal in Arsenal's 3-nil victory over FC Copenhagen in the Champions Cup Qualifiers, Alex Codswallop. Alex, welcome. Alex: Thanks Martin. It's great to be here. Martin: Your goal on Wednesday was a thing of beauty. Could you tell us how it happened? Alex: Certainly. I must say I was fortunate when the Gaffer, Mr. Arsene Wenger, gave me my first team debut in such an important match. He had me positioned in a deep lying forward role, just behind Thierry Henry. Martin: Yes, you partnered very well with Henry. Martin: I'm sorry, did you say "solar pulses?" Martin: Oh... well, erm... please continue. Alex: Yes, in sequence with the solar pulses, varying this pattern whenever Copenhagen's centre halves strayed outside the primary nexus of their defensive parabola or if stratocumulus cloud cover obscured the gamma radiation emmitting from the sun. This structure, combined with a steady application of the Heinsenburg Uncertainty Principle, led to my goal. Martin: I'm sorry. When exactly did the goal occur in that sequence? Alex: I was just coming to that, Martin. After Emmanuel Eboue made that sparkling run up the right half in the 56th minute, astutely reacting to the sudden influx of nitrogen caused by the simultaneous opening of 12 bottles of Chateau Mouton Rothschild in the Executive Luxury Boxes at the Emirates Stadium, and aided and abetted by his magnificent understanding of how Cartesian Dualism influences Northern European defences, I was able to channel my chi energies into the inside right, applying delicate pressure and neo-existentialist epistemology to the Copenhagen holding midfielder. Martin: You're referring then to the shoulder charge you gave him as the ball came to you? Alex: (laughs) Yes, well that's one way of looking at it. Anyway, making sure to rotate my striking foot in an even parabola, and careful to resist any confusion from wave particle duality that the incoming ball might have imparted to my reasoning, I was able to turn the ball at a 54 degree angle into the upper-right quadrant of the goalmouth, anticipating that the goalkeeper was expecting me to engage in a straightforward mathematical approach to the probability of the situation and attack the wide portion of the goal. Fortunately, the slight increase in air pressure, caused in part by rapidly moving warm fronts in the Brasilian subsection of the Southern Hemisphere and transformed via chaos theory and the unusually large population of Small Pearl-bordered Fritillary butterflies in Cardiff, Wales this year, prevented the ball from rising too quickly to hit the target. Martin: (looking a bit dazed) Erm... yes, a splendedly taken goal. Martin: Hmmm... Alex, amongst the many things you mentioned in your complex description of the goal, you made a reference to Heisenburg. Wasn't he a theoretical physicist of the early Twentieth Century? Alex: Yes, of course, but not many people appreciate what a great footballing mind Heisenburg had, when he wasn't out bollocksing up classical physics. It was his initial rejection of quantitative certainty in quantum measurement that led directly to Herbert Chapman's development of the WM formation in 1925. Martin: It wasn't the change in the offsides law? Alex: (laughs) No, no... loads of people make that mistake. The offsides change merely precipitated the philosophical instability in the football world to enable managers to turn away from the dialectical materialistic approach and towards the integration of quantum mechanics with an episemological optimism. Martin: I had no idea. Alex: Well, most people don't realise how important philosophy and quantum mechanics are in modern football. Martin: Finally, most observers have pointed out that the turning point in the match was when Arsene Wenger shouted out a tactical change early in the second half. However, not many people have figured out what he actually said. Was he speaking French? Alex: No, it was Greek. He was quoting Aristotle's famous maxim about the importance of of a positive outcome to pragmatic football. Martin: What exactly did he say? Alex: Well, the literal English translation is, "Get the ball forward, you stupid bastards," but there's a great deal of nuance implied in the context. Alex: Not to mention 2,300 years of commentary. I've always been particulary influenced by the way in which Ludwig Wittgenstein analysed the maxim in relationship to Cliff Bastin's free-scoring ability from the wings in an age of centre-based, direct attacking philosophy.